Flares illuminated the clouds of smoke that rolled down the streets. Lines of policemen in riot gear threatened civilians with clubs, water cannons and rubber bullets. Anti-autocratic fervour had gripped the city, and the government’s response was a crackdown that only proved the protesters’ point. The police had used so much tear gas that its effects could be felt across the Golden Horn, in the conservative districts of the old Ottoman city, but the ultras of Istanbul were in the heart of it all, begging for more. Turkey went through a shock early in the summer of 2013, when scenes like these played out all over the country and, particularly, in its largest city. People had not expected such brutality in response to a peaceful environmental protest, nor could they have imagined how many people around the country took to the streets to protest the government’s reaction. The Gezi Park movement was full of surprises. The ultras were one of them. 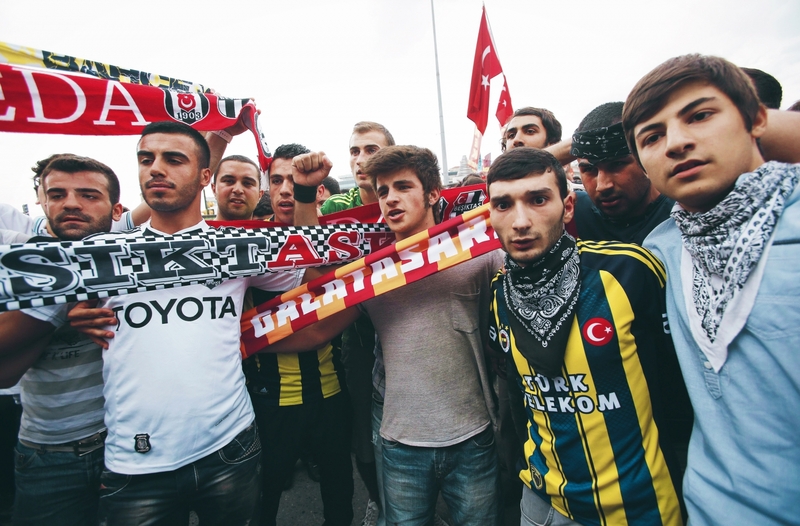 Though their presence in the thick of the violence and their gleeful taunting of the police were nothing new, something was happening that most Turks had never believed possible: supporters of Galatasaray, Fenerbahçe and Beşiktaş were coming together. In some countries, it’s common to see fans of rival teams put their differences aside and show solidarity in times of national crisis. Turkey was never one of those countries. Until the protests swept the nation, supporters of the Süper Lig’s three most successful clubs were about as likely to find common ground as conservative Prime Minister Recep Tayyip Erdoğan was to appear at an LGBTQ pride parade. UltrAslan, the premier ultras group supporting Galatasaray, is known across Europe as one of the most fearsome football supporters groups in the world. They became world famous for the ‘Welcome to Hell’ banners with which they greeted visitors to the old Ali Sami Yen Stadium, and their satanic imagery and ubiquitous flares make visiting the home of Turkey’s most successful club a rather frightening experience. The club, born out of the first European-style high school in Turkey, calls the Western side of the Bosporus home. The area around the school, known as Galatasaray, Beyoğlu, or Pera, is the closest thing Istanbul has to true centre, a stretch of old monuments and expensive shops sloping up from the Galata Tower to Taksim Square and, next to it, Gezi Park. Gala – also known as the Lions or the Conquerers of Europe – now play further inland in an arena with a capacity of over 52,000, but their yellow and gold banners and shirts appear all over the European side of the city on game days. 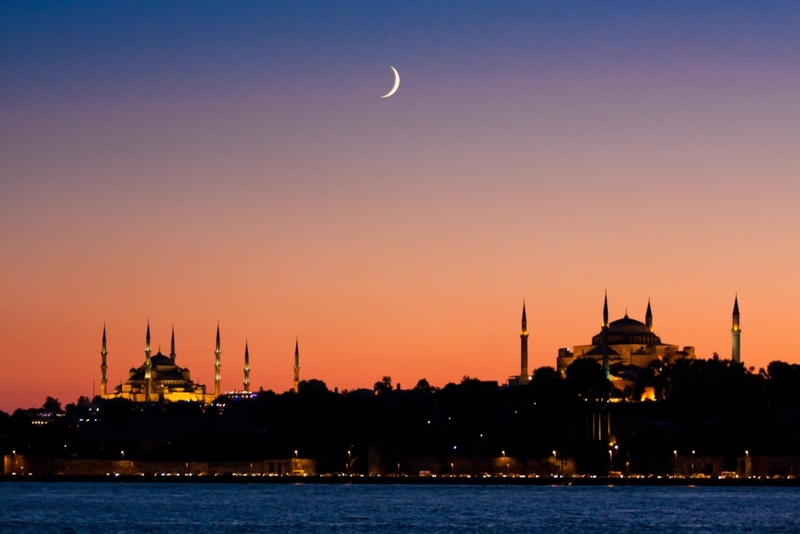 A tourist visiting Istanbul could easily surmise that Galatasaray was the force in the city’s footballing world. Fans of Fenerbahçe would have something to say about that. Hailing from the Asian side of the Bosporus, the Yellow Canaries have won the league 19 times to Gala’s 20, but their fan base is every bit as fervent. Their detractors accuse Fenerbahçe fans of being new money statists, pointing to the fact that Erdoğan himself identifies as a supporter. While there are right-wing Fenerbahçe supporters groups (the same can be said of Galatasaray), there are vocally left-wing ones as well. Outside Left and Vamos Bien, which touts its opposition to “industrialised” football, joined in during Gezi. For most fans, however, the Gala-Fener divide is far and away the most important. The rivalry between the two clubs is as intense as any in sports. Most of the country has taken a side, and the Intercontinental Derby is always tense, if not worse. When the two teams contested the Turkish Cup final in 2016, the referee dished out a total of seven yellow cards and one red. For large portions of Süper Lig history, away fans have been banned from attending on derby day, and for good reason. Things had come to a head, horrifyingly, only two weeks before Gezi Park. Allegedly incensed by Fenerbahçe’s fans’ racist taunting of a Galatasaray player, a Lions’ ultras stabbed a young Fenerbahçe supporter to death while waiting for a bus. Burak Yıldırim was not the first fan to lose his life to this rivalry, nor would he be the only young supporter Fenerbahçe would lose that summer. Financially and in terms of historic success, Beşiktaş is the third of Istanbul’s big three. Its ultras, however, are far and away the most politically and socially active. Situated downhill from Taksim and its tourist attractions, bumping up against the straits that divide East and West, the neighbourhood that gives Beşiktaş its name is vibrant and, traditionally, working-class. More than the other big three clubs, the Black Eagles identify with the area from which they arose, and many locals respond by giving their heart and soul to the club. Members of the far left, which long ago ceased to be a force in Turkish politics, find a place to express themselves amongst these ultras. Çarşı are quick to take up the causes of labour, the environment, and anyone else they feel needs a protector, and as a result they are no stranger to dissent. Not only had they written a chant about tear gas (“Sık bakalı”) well before Gezi, they also knew how to mitigate its effects. The Gezi Park protests began on 28 May 2013 with a simple environmental demonstration. A small group camped out in Gezi Park, a shady area adjacent to Taksim Square, in an attempt to stop it from being bulldozed and turned into an Ottoman-themed mall. The simple construction project was rife with symbolism, particularly because it came at a time when many feared the centre-right government was slipping into authoritarianism. After the police used pepper spray on the environmentalists and burned their tents, protesters flocked to the park and the adjacent square. Several days and nights of clashes between protesters and police followed. Every time the police tried to clear demonstrators out of the area, their numbers grew, and by June, protesters were coming out in the tens of thousands in Istanbul, Ankara and other Turkish cities. 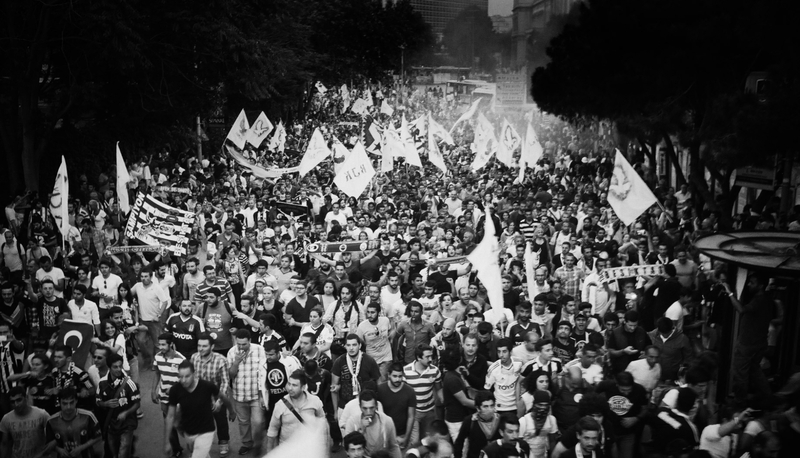 Soon, Gezi Park was a movement, uniting all those who felt that the Erdoğan was becoming a dictator. That turned out to be a lot of people. Though Turkey’s environmentalists, Kurds, feminists, leftists, LGBTQ community and others had publicly expressed their grievances before, they had never come together in this way, nor had so many other Turks sympathised with them. Taksim Square took on a festival atmosphere. There were communal prayers, pop-up libraries, even concerts staged in this public space, but there was also the constant threat of police brutality. As if drawn by the peculiar blend of festivity and danger that characterises so many Turkish match days, Çarşı quickly joined the demonstrations. They hoisted their banners and spray-painted their anarchist symbols, but they also brought a wealth of police-defying experience to a movement that badly needed it. Many of those who demonstrated during Gezi were new to confrontations with police. In their accounts, they often credit the ultras with keeping protesters safe, breaking up fights, and instructing others on how to evade and take shelter from the police. Just hours after Çarşı had appeared on the scene, Fenerbahçe and Galatasaray’s ultras arrived. There was a feeling amongst all the left-leaning ultras that their involvement in this movement was preordained. Videos from all over Istanbul appeared on social media, depicting marching lines of gold-and-red Galatasaray jerseys, blue-and-yellow Fenerbahçe kits and the black and white of Beşiktaş. Then came the scenes that Turks had never imagined. One could have been forgiven for expecting violence when these groups met in the midst of a riot, but there was none. Instead, there was solidarity. Images coming from Istanbul showed burly Galatasaray supporters locking arms with women in Beşiktaş colours. Gala and Fener supporters posed with Çarşı banners. Ultras from all three sides embraced, draped in the Turkish flag, and chanted, “Shoulder to shoulder against fascism!” Just weeks before, a young man had lost his life for wearing a Fenerbahçe shirt. Now there was only Istanbul United. Suddenly, every big three supporter could be Çarşı. Fenerbahçe fans choked a bridge between Europe and Asia with their flags as they marched toward Taksim. When ultrAslan announced it did not want to be involved in the unrest, other Galatasaray fans carried on anyway. They sang the name of their star striker, Didier Drogba, whose mildly supportive comments they took as proof that their club resisted Erdoğan. As far as anyone can tell, these demonstrations of unity arose organically. Some described them as inevitable. Though various supporters’ groups made their presences known to varying degrees, hundreds of individual supporters of each club took part in the protests, often making a point to embrace those wearing their rival’s colours. These individual acts were, in a way, the most profound. Ultras tended to take on some kind of political affiliation, so perhaps it was inevitable that each club’s leftists would find each other in the fray. But there had been millions of fans for whom club football was a blessedly separate from politics, and now they had taken to the streets. Something had changed. The following September, fans stormed the field and hurled chairs at police during the dying minutes of the first Beşiktaş-Galatasaray match since Gezi. Political statements were supposed to be banned from all matches, but Fenerbahçe’s supporters solemnly sang about Ali İsmail Korkmaz, a 19-year-old Fenerbahçe fan beaten to death by the police during a Gezi Park protest in Eskişehir. Of the 35 members of Çarşı arrested that summer, several faced life in prison on terrorism charges, although they were eventually acquitted. Recep Tayyip Erdoğan remained in power. He remains in power today. If there is any cause for the ultras of Gezi to take heart, perhaps it is a similar symbolic victory. Turkey did not enter a new golden age that summer, nor did Gezi usher in an era of good feelings between the three warring clans. That era lasted only an instant, but the images it produced will live on as proof that Istanbul’s ultras can agree on something.